Your Glendale Jazz Band performed a the Parkview Jazz Festival yesterday. The performance can be viewed on the Music page on our website or directly by clicking the link. Brian Derenski Photography will be here Friday morning to take our band photos again this year. This is an early morning event and everyone will be in full uniform. Treat this as an early morning practice and plan to arrive at 7:00AM to get into uniform and be ready for photos. Every student will be photographed even if no photos are purchased, so please download the order form and fill in the student info and just write "No Order" in the payment area. Order forms will also be sent home this week. Here is the information link from Brian Derenski Photography. Please take a moment to read the info and share with your student, so everyone is in the same page. Need your car washed? Blue Iguana car wash is donating 25% of their sales to the Falcon Regiment when you enter the code 1017! What a deal. No matter what option you chose for your car or truck, we will receive 25% of the sale. It’s only for the month of October. You can use this code as much as you want. Tell your friends and neighbors the code so they can use it when they get their car washed. Please see the LINKED FILE for details! Band Booster will be meeting tomorrow Monday Sept 18th at 6:00PM in the Glendale Cafeteria area. All parents are welcome and encouraged to see how the band runs and provide input on issues and planning ideas. We really need your help to keep things moving smoothly. We still need a Fundraiser Chair person to help with organizing the many funds raising activities that keep the band fees from going up. It is not difficult and this is the perfect time to start learning how the position works as most fundraisers are already planned. We look forward to seeing you there. Band Camp starts Monday!!! Camp will run from 12PM - 9PM. Be sure to bring a water bottle and sunscreen. Dinner break is from 4:30 - 6:00PM. We will be inside from 12-4:30 and outside from 6-9PM. Be sure to wear gym shoes, shorts and and light color shirt. The Band Boosters will provide dinner for the kids on Wednesday. The Parent Preview on Friday will start at 6PM in the GHS Gym. We will have refreshments after the performance. If you have not brought in your childs beverage or snack donation for the marching season, please bring them this week. Also, bring any remaining forms and have the first band fee payment completed. Band fees can be payed by check sent to the band office or by card through Paypal on the Charms site. A link to Charms Assistant can be found on our website www.glendalebands.com under the forms and Links tab. Our first mini band camp of the summer is this Tuesday through Thursday, June 27th-29thfrom 12:00 p.m. until 9:00 p.m. each day. Please make sure your student brings a water bottle and sunscreen. Students should also wear tennis shoes and socks. If your student has not returned the band forms sent in the packet, please have them bring the forms to camp. They can place them in the black lock box outside Mr. Cronkhite’s office in the band room. If you have any questions, feel free to respond to this email. Thank you for your support. We are looking forward to a fun and exciting year! 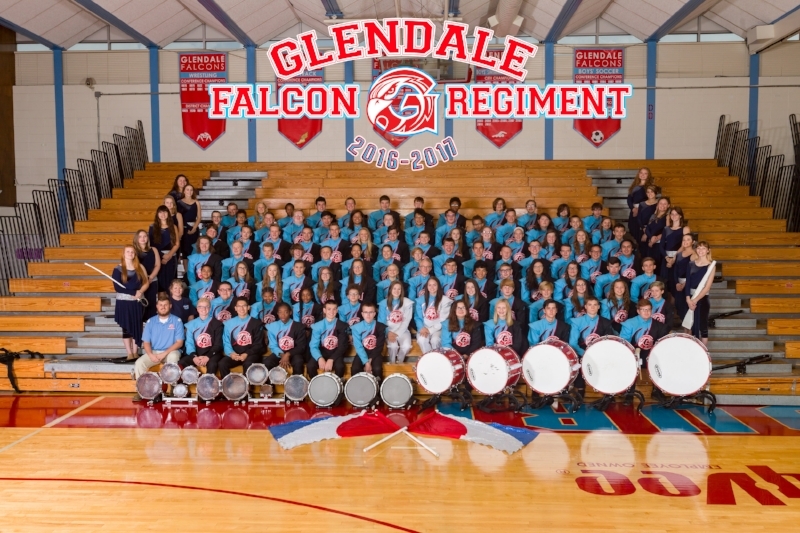 Please join us for the mandatory informational meeting for Glendale Marching Band. Thursday June 15th from 6:00 - 8:00PM in the Glendale High School Auditorium. In depth information will be relayed, boosters will talk about upcoming events as well as our major fundraiser and forms are to be turned in. Please bring your assigned snacks and drinks to the meeting. Boosters will be on hand to collect them from you. Every class needs to bring water. Wth temps already topping the mid 90's we will be going through lots of water to keep them hydrated in July. For reference please see the flyer for Band Camp here. APRIL 5, Wednesday, Symphonic Band and Winter Guard will be performing at both Hickory Hills and Pershing Middle School. Participating students will need to arrive at Glendale by 7:15 am and wear their show shirts from this fall.